Artists have developed many ways of working with precious metals to enhance the making of jewelry. 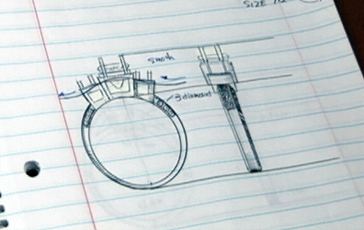 All jewelry designs, regardless of how they are made, begin with a sketch and an idea. 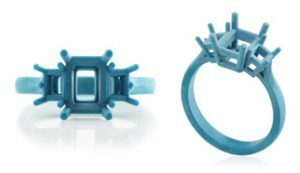 The techniques of die striking, wax casting, electroforming, and hand fabrication are not mutually exclusive; finished jewelry is often a combination of pieces created by different manufacturing methods. Die striking or stamping is a very old method for making coins and jewelry. Today, the jewelry making process begins with the creation of a pattern or design in the form of a metal die . The die is usually comprised of two parts, a punch and a mold, which are often made of steel. The dies are placed into powerful machines that are fed “blanks” (plain pieces) of precious metal. 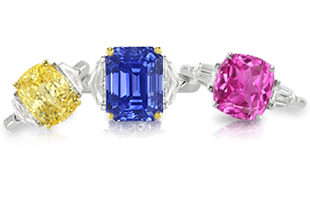 When the blanks are struck by the die, a three dimensional piece of jewelry is created. Rings and their corresponding dies. Die striking is a popular manufacturing method; once the die is created, it is a rapid and cost effective means for producing a high quantity of items. The die striking process also creates items with consistent quality. Die struck items have sharp edges and crisp detail and require minimal cleaning before polishing. 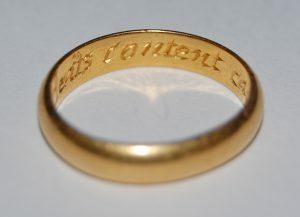 Gold ring with engraving on the inside. The main benefit of the die striking process is that it yields products that are dense and durable. 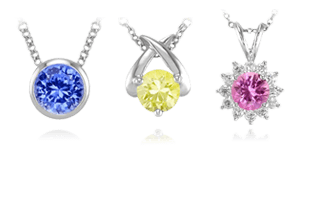 This means die struck jewelry wears well and can withstand a high polish. Die struck items are also ideal for engraving. Because it produces items that are naturally strong, the die striking process is especially recommended for the manufacture of prong settings, although it is also commonly used to make pendants, earrings, and rings. The beginning of the casting process: wax injection into a mold. Once the investment has dried, it is heated to melt the wax within. The melted wax is drained from the mold to leave behind a hollow space that is then filled with molten metal. A vacuum or centrifugal force pulls the molten metal into every nook and cranny within the mold. The metal is allowed to solidify and harden. When the investment is removed, it reveals a precious metal “tree” of castings. The castings are removed from the trees, cleaned, and polished. 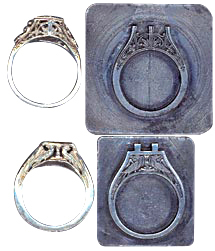 The casting technique is a relatively rapid and economical means of making identical pieces. Because the originals are made from wax, which is easily manipulated, the technique offers unlimited design potential. However, cast pieces are slightly less dense than die struck pieces and may wear easier. Cast pieces typically require more polishing and clean up than those produced via other manufacturing techniques. 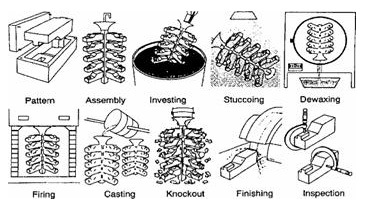 A diagram of the jewelry casting process. Image from monmet.com. The process of electroforming. Image courtesy of the World Gold Council, www.gold.org. Electroforming is a jewelry making technique that uses electricity to deposit metal over a model. 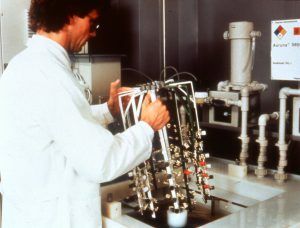 It is related to the technique of electroplating, which also became popular in the first half of the 19th century. When an item is electroplated, a model (usually made of wax), is dipped in electrically conductive paint and allowed to dry. Many identical models are attached to a frame and submerged in a special chemical bath. 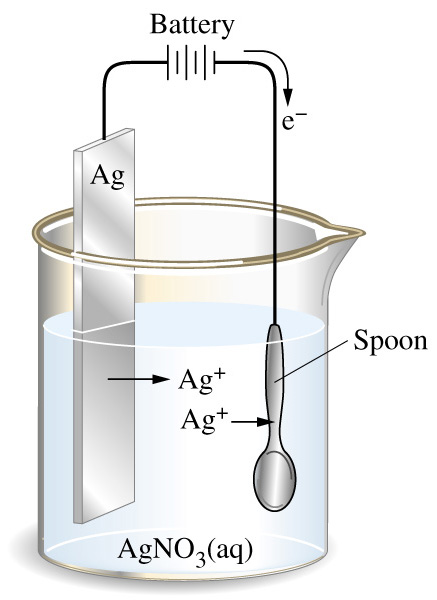 An example of silver (Ag) electroplating. 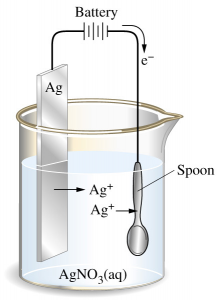 Here, the anode is a silver bar and the cathode is an iron spoon. An electrical current is passed through the bath to give the models a positive charge. The positively charged models will then attract negatively charged particles of a metal such as gold. The models are rotated within the bath to give an even coating of precious metal, which is built up in successive layers. When the metal layer is sufficiently thick, the wax model is melted away, leaving a hollow shell of precious metal. Electroformed pieces can be exquisitely detailed. While they naturally have a matte finish, they can also be polished to have a bright finish. 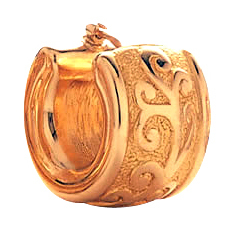 Originally, gold electroforming required 23K or 24K gold, but since the 1980s electroformed pieces have been manufactured from 14K and 18K gold. This has helped to increase the popularity of this process. A close-up of an electroformed earring. Electroformed earrings are typically lightweight and comfortable to wear. 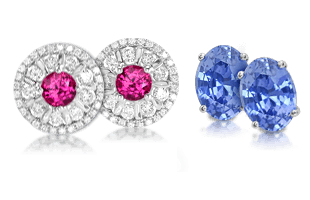 Because electroformed pieces are hollow, they can be large but relatively lightweight, making them economical and well suited for earrings and other jewelry items where weight is a concern. Unfortunately, electroformed pieces dent very easily. 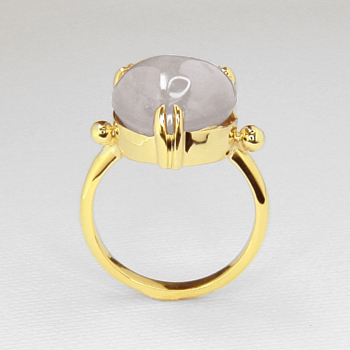 Because of this quality, the process is not typically used to make rings or bracelets. It is also difficult to repair electroformed jewelry; it is more common for manufacturers to replace a piece than repair it. A jeweler at work on a hand fabricated piece. Hand fabricated jewelry has been made for thousands of years. The process requires a great deal of time, skill, and patience. In an age dominated by mass production, it is less common to find one-of-a-kind hand fabricated pieces today. 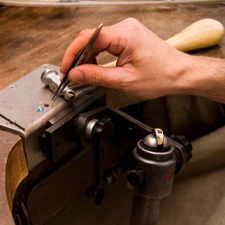 The term hand fabricated applies to a piece of jewelry that has been created entirely with hand tools and methods including hammering, sawing, carving, soldering, setting, and finishing. A beautiful hand fabricated star sapphire ring. Hand fabricated jewelry is prized for its quality and originality. Because hand fabricated pieces are painstakingly produced by skilled craftsmen, they are often beautifully finished on all sides, including the back and other hard to reach areas. 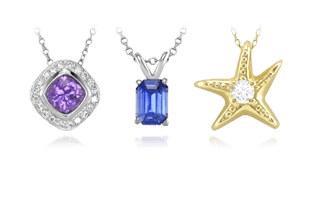 Now that you have explored the manufacturing processes, we will delve into the types of Finishes and Decorative Techniques | Definitions and Pictures that make jewelry so personal and special.